All those tubs of basil-rich pesto available on the supermarket shelves may be convenient, but they can't hold a candle to fresh, homemade pesto made with in-season basil. The only problem is that basil has a bit of a short season, so when it is in peak, you need to grab it (or harvest from your garden) and grab a lot, and then use it right away to make large batches of pesto. But don’t worry—you don't have to eat it all at once since pesto freezes beautifully. Freezing pesto is also super easy. There are two ways to go about freezing pesto, each with different end-uses. You can freeze pesto in larger amounts (1/2 to 1 cup) that can be tossed with pasta for a quick dinner, as well as smaller amounts (1 to 2 tablespoons) that can be added to other dishes for a burst of basil pesto summer flavor when the weather turns less warm and sunny. 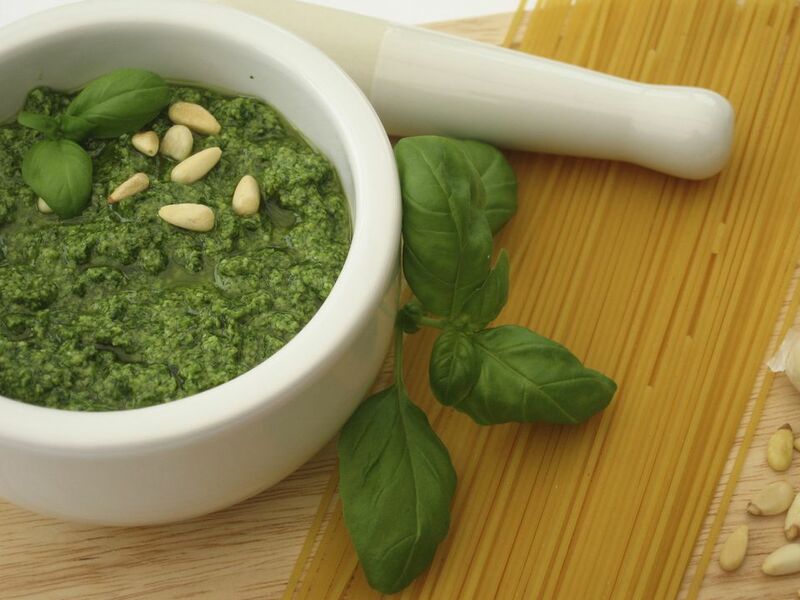 Whether you’re freezing a small or large batch, use the frozen pesto within 6 months. To thaw frozen pesto, either place in the refrigerator ahead of time or microwave on the defrost setting, stopping and stirring intermittently. Having large amounts of pesto on hand is perfect when you need to throw together a quick dinner, such as tossing with a bowl of pasta or using as a flavorful topping for grilled salmon. It is also handy when you need a speedy appetizer, or want to try a simple but impressive recipe for stuffed chicken breasts. To freeze larger amounts of pesto—from 1/2 cup and up—transfer the pesto to a sealable container, cover the surface of the pesto with a thin layer of olive oil, tightly seal the container, and place in the freezer. That layer of olive oil will minimize browning on the surface of the pesto as it freezes. While you can freeze pesto in full-batch amounts, it is also convenient to freeze pesto in smaller portions to be used as quick flavor-enhancers (without being the full flavor force of the dish)—swirl in soups or stir into salad dressings, or add a dollop to a bowl of rice. To freeze small amounts of pesto, put spoonfuls of pesto into ice cube trays and place in the freezer until solid. Then transfer the pesto cubes to sealable plastic bags. Whenever you want a little hit of summer basil flavor, just toss a cube or two into the hot dish; or defrost and spread onto sandwiches. In addition to adding a layer of olive oil before freezing a large batch of pesto, you can use another trick to help maintain the basil’s bright green hue. For truly brilliantly green pesto, you need to start at the beginning: the basil. Before whirling the basil leaves in the food processor, give the leaves a quick dunk in boiling water (in other words, blanch it) to "set" its green color that stays, remarkably, a beautiful brilliant green once made into pesto. There are so many creative and delicious ways to incorporate pesto into recipes, beyond simply adding to a bowl of pasta. When unexpected guests arrive, throw together a quick appetizer by using the defrosted pesto as a spread on crostini and topping with slices of tomato and mozzarella. Add to a simple salad dressing, or spread on a turkey or chicken sandwich. Serve a dollop with grilled vegetables, or change up your typical pizza by featuring pesto as a topping.